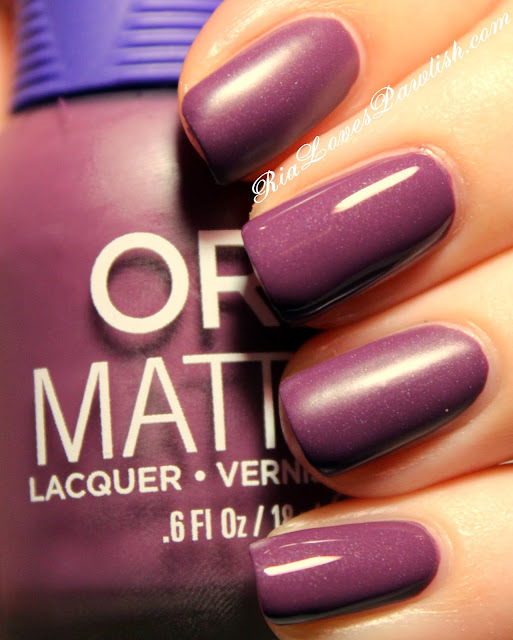 today's polish is Orly Matte FX Purple Velvet. it's a plummy purple that dries to that rubbery, satin finish... not really 'matte' in my opinion! it has a subtle white shimmer shot all through which really comes out when topcoat is added. it was amazingly easy to work with, some people could use it as a one coater. i needed the two to cover up one or two very slight patchy areas... perfection. my only complaint is that it takes forever to dry... and you can't use a topcoat or you'll ruin the finish. this being said, it's beautiful with topcoat, so two polishes in one! two coats Purple Velvet, pinkie and middle fingers one coat Seche Vite. Pretty polish!! My favorite is the glossy version.